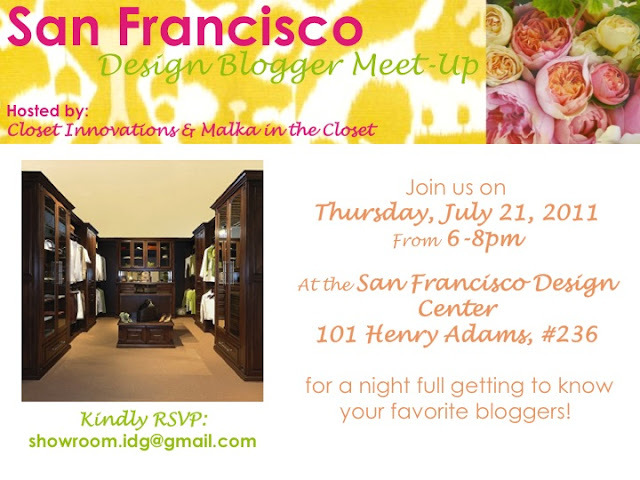 Ten June: San Fran Blogger Meet Up! I've got some exciting news. For those of you west coasters, listen up! A big time blogger meet up! How exciting is that?! You may be thinking... hey Michelle? Don't you live in Georgia? Like, on the other side of the country from San Fran? Yup. But it just so happens that my sister (Tori) and I were planning a little trip to Cali and we will be able to make the meet up! and Cristin from Simplified Bee. If you are a design blogger and you are interested in attending, please RSVP to showroom.idg@gmail.com. And please shoot me an email and let me know you're coming! I can't wait to hear who can make it. Bummer I'm not a design blogger, however San Francisco is my home so if you would like some recomendations on restaurants, etc... Let me know! I'm giving my hubby the puppy dog eyes right now!!!! im upset about this...because i am there june 15-23...were u trying to avoid me rhonda bear? I wannaaaa cooooome!! I've been dying to go back to Cali for quite some time now!! Maybe I can use one of my free flight deals..I'll check and see if it's good on those days. Are you all staying at a hotel or something? Amazing! I wish I could come! What fun! Totally jealous that I am east coast based. You ladies are going to have a ball. SCORE! I will be there...we finally get to meet. I am so excited! "Guess who's back? . . . Back again." Hi friend! This is going to be soooo much fun. Super duper excited. This sounds SO fun! Im jealous!! I hope you ladies have a fantastic time and there better be LOTS of pictures! Hmmmmmmmm, I'm working on it! Are you and your sister staying in a hotel? So fun! Wish I lived closer (or had a trip planned)! So jealz! I'll be vacationing in Kiawah, SC with my fam that week!